We’ve heard some ridiculous plans when it comes to immigration reform. 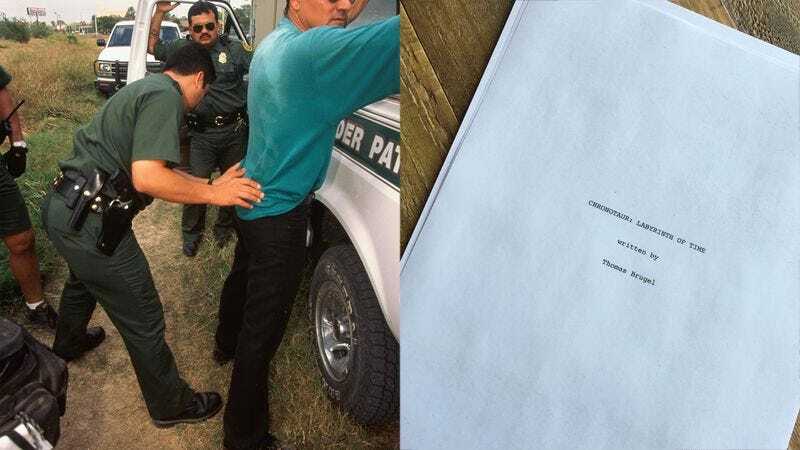 Politicians like to claim that it’ll be easy to arrest millions of undocumented workers living in America, or that we can simply slap up a 10-foot wall and instantly stop anyone from crossing our border. But to those people I issue this warning: If you think immigration is a simple issue with a quick fix, you’re just as ignorant as the scientists meddling with time travel in my screenplay Chronotaur: Labyrinth of Time. The central problem is viewing immigration as a security issue instead of an economic one. Undocumented migrants may have broken the law, but it’s counterproductive to treat them like violent criminals and have them thrown in prison. When Raymond discovers the Time Maze, a dimension of infinite corridors that connects every point in space-time, he assumes he can use it to travel back and rescue his wife Elizabeth from her fatal car crash. However, the past isn’t meant to be changed any more than prison is appropriate for hardworking migrants who only want to make a living. You might assume that arresting illegal immigrants would halt migration, but that’s the same kind of false assumption the scientists made when they decided that the neolithic cave paintings of the Chronotaur couldn’t possibly depict a real creature. Building detention centers and border fences would do nothing but line the pockets of corporations, who like the Quantum Consortium don’t care about human suffering if it’ll earn them a buck. When the Chronotaur begins striking researchers with his Entropy Axe, aging them 100 years with a single blow, Raymond begs billionaire Otis Slate to let him shut down the gateway to the Time Maze, but the greedy executive argues that they’ve invested too much money in Project Daedalus to quit now. The uselessness of throwing money at law enforcement and hoping that stops immigration is perfectly illustrated by the scene where the Chronotaur finds Slate cowering in the men’s bathroom, and before getting his comeuppance Slate takes out his wallet and fruitlessly tries bribing the Chronotaur into sparing his life with a wad of $100 bills. The Chronotaur, of course, only snorts quizzically at the money and then taps the businessman with one of his glowing hoof-hands, immediately decaying Slate into a cobweb-encrusted skeleton. My point is that although Chronotaur is a sci-fi horror thriller, it’s also punctuated by moments of levity that make it a real crowd-pleaser, and we have to be smart on immigration. While Congress engages in political posturing, and production companies pass on my screenplay, nothing is getting accomplished. We need legislators with the bravery of Raymond and Elizabeth Childress, who destroy the tachyon reactor on their own, but unfortunately by that point the Chronotaur has already absorbed enough lifespans from his victims that he can exist outside of the Time Maze indefinitely. America cannot afford to jail the 11 million illegal immigrants living in the U.S., and once the gateway is destroyed the only option is to use the original prototype of the time drill to dimension-dig back into the Time Maze and confront the Chronotaur on its own turf. The most important thing to keep in mind is that immigration is actually good, just like the Chronotaur, who is a cosmic guardian that protects the integrity of the timeline. You don’t have to get chased through key historical events like the Battle of Waterloo and the asteroid that killed the dinosaurs to know that immigrant labor is essential for a thriving economy, and that my script would be a surefire hit with the potential for a merchandise line of toys and video games. Similar to the Chronotaur, you can’t stop illegal immigration through force, even if you shoot it with a harpoon gun that you grabbed off a whaling ship in the 1800s. The Chronotaur’s killing spree can only be halted by following The Rule of Time Travel, which states that for every life saved through time travel, another must take its place. Raymond travels back to the car crash and alters history again so that he dies and Elizabeth lives, erasing himself from the present. His sacrifice is not in vain, for as Raymond vanishes, the Chronotaur gives him a gruff nod of approval before turning away and stalking back into the halls of the Time Maze where it shall roam for all eternity. Immigrants aren’t our enemies. They aren’t here to steal our jobs. They’re just people who would love to see Chronotaur in theaters, and deserve a chance to work hard and earn their citizenship after a few years. I also have plans to write a sequel, Chronotaur 2: Thread of Destiny, where we’ll meet the Chronotaur’s wife, and if there’s interest from the networks I have some ideas on how to adapt the Chronotaur franchise into a TV series. If you’re a producer, drop me a line and let’s make this happen.